As readers may have already surmised, he was addressing Catholics of a conservative and traditional disposition, and upbraiding them for (I suppose) their excessive preoccuptation with good liturgy, and for their presumptuous opinion that it is better to have certain “externals” rather than others — for example, to have the Latin language, chant and polyphony, the ad orientem stance, all-male altar service, and kneeling for communion, rather than their all-too-common alternatives. I have come to think of this attack on externals as a kind of archetypal error of our day and age. It is no mere difference of opinion; it goes to the very roots of our faith. To begin with, when and where do we see human beings fixated on externals? Ancient Israel, like its neighboring nations, seems to have had an irresistible hankering for idols of wood, stone, or metal, and when European missionaries arrived in pagan regions, they found craven tribesmen who worshiped trees, animals, or totems. Superstition has often reared its ugly head in religious history. Undoubtedly there are individuals with a mental handicap by which they latch on to particular objects or actions and seem incapable of passing through the symbol to its meaning. More subtly, there may well be the occasional ritualist who is so intent on the finer points of rubricology that he misses the forest for the trees. Yet these categories of people are not likely to have been what the speaker had in mind. His message ran more along the lines of classical Protestantism: externals in religion are, at best, useful things, and, at worst, dangerously misleading ones, but they are not essential on our path. The moment one says “you can get too caught up in the externals and forget that it’s all about your interior relationship with Jesus,” one is creating an artificial dichotomy, a fictitious opposition, an almost Manichaean division between the sensible and the spiritual that puts them in tension rather than seeing them as providentially interconnected. Carried to its furthest conclusion, the view that externals don’t matter, or that they matter only in “moderation” and with a hearty dose of relativism about other possible configurations of externals, runs the risk of repudiating or marginalizing the Incarnation and the sacramental system by which it continually irrupts into our world. It will provoke over time a rejection of the “scandal of the particular” in favor of a bland ecumenism in which all paths to salvation and all expressions of faith are valid, as long as one is sincere in one’s devotional life. It will express itself in a disposition that is more welcoming to evangelical Protestants, who are outside of the unity of the visible Church of Christ, than to traditionally-minded Catholics, who, prioritizing a certain definite ritual worship as Catholics have done for at least 1,500 years, are definitely inside of it. We are looking at nothing less than a temptation to reject the Catholic religion in favor of an American religiosity that looks more to “where the heart is” than to where the intellect is in its act of faith and what the definite object of that faith is. As St. Thomas teaches, we cannot have the charity of God if we do not believe in Him first. In this sense, love — understood not as an instinct or emanation of the soul, as the modernists do, but as an infused gift from above — depends radically on the integrity of our faith. If you damage that integrity (and there can be no doubt it has been grievously damaged throughout the Church on earth over the past fifty years), you will weaken and eventually undermine the charity that is Christ’s most precious gift and the Christian’s most valuable possession. In short, there is no Christianity without the Incarnation and all that it makes possible and necessary. The very essence of Christianity is the embodiment of the divine, the materialization of the Word, the irruption of the eternal and the boundless into time and space, so that through these means we may rise up to immortality and the beatific vision, perfect communion with God and one another. There is no shortcut. 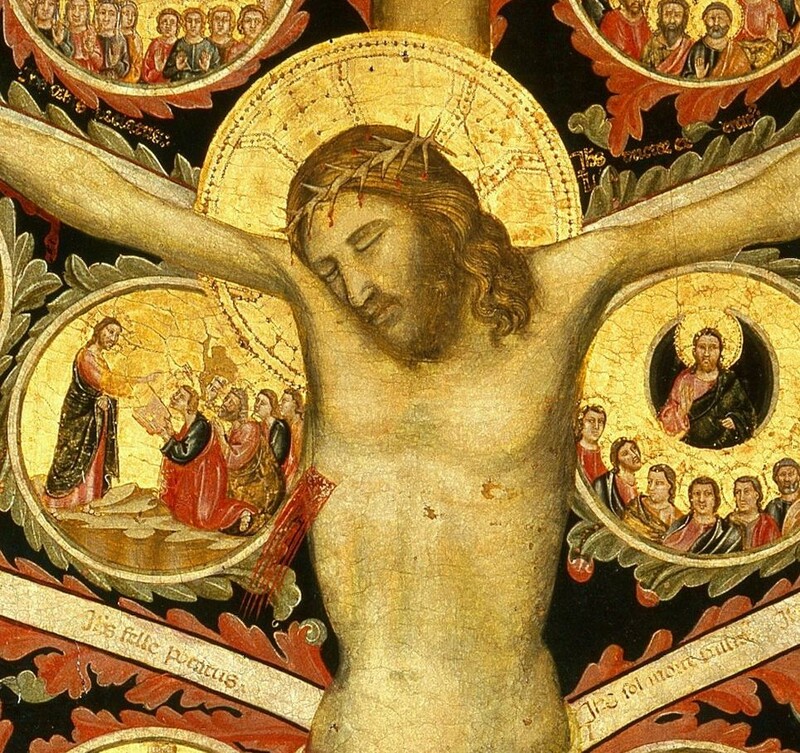 All will be saved by flesh, by signs, by the blood-soaked Cross, by . . . externals. Someone may object: “But Jesus Himself said that a time was coming when men would worship not on this mountain or that mountain, but in spirit and in truth. He’s basically saying that worship is about being spiritual and truthful, not about doing this or that, or any particular rite or offering.” If we say this, however, we make Our Lord flagrantly contradict Himself. 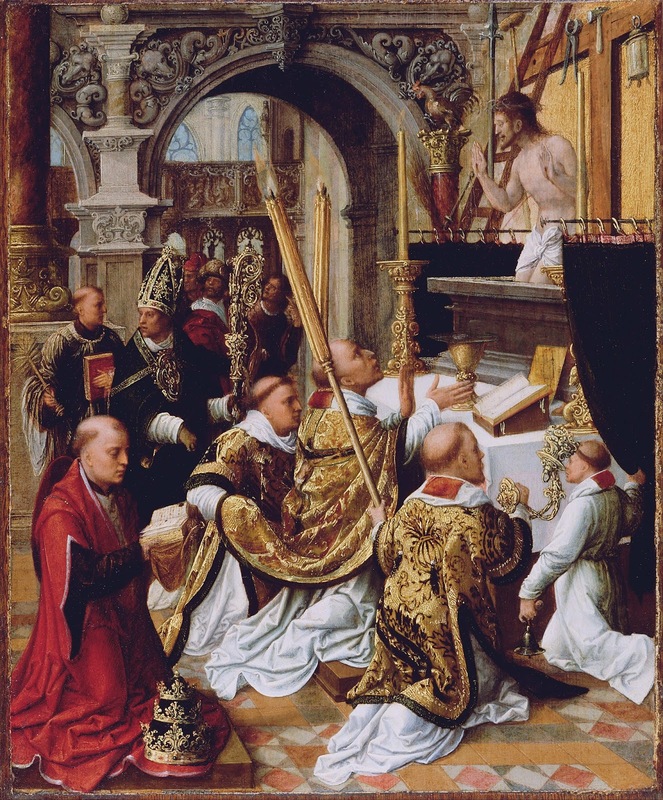 For it was He who established the sacrifical banquet of the Eucharist at the Last Supper, saying “do this in memory of me,” and it was He who, lifted high upon the Cross, gave us the perfect reality of worship in spirit and in truth, in the sacrifice of His pierced flesh and streaming blood. The particular once-for-all oblation of His particular Body and Blood is our salvation — and this oblation is made present for us in the mystery of the Most Blessed Sacrament. In this sense, to be without the Holy Eucharist is to be without worship, without salvation, without spirit and truth. Re-read John 6. Hence, the error about which we are speaking is not an incidental one. It is a temptation to disincarnation, to distancing ourselves from that which, for us, here and now, must be of primary and vital importance. We are called to embrace the one and only Word-made-flesh, not the Word in abstraction or in a private and therefore individualized world of devotion. We cannot bypass the ladder of Christ’s humanity and each rung thereupon: the sacraments and sacramentals, which are signs potent for salvation; the sacred liturgy, where heaven meets earth and immaterial realities are clothed in color, tone, fragrance, and taste; the Eucharistic sacrifice, “font and apex of our entire Christian life”; the corporal works of mercy, through which Our Lord touches the needy through our own hands. And we must not deceive ourselves by thinking that these things have a full and proper existence apart from Catholic tradition, through which they came to us in the first place, and from which they have their permanent and self-abiding justification. When we innovate, when we experiment, when we pluralize and privatize the devotional life, we are sawing off the branch on which we are sitting. As mentioned before, the speaker said we should never think that a certain set of preferences (“A, B, C”) is better than another set of preferences (“X, Y, Z”), if both are permitted. But what if it is possible for us to know that A, B, C really is better than X, Y, Z — significantly better? Better because more aligned with the expressions and needs of human nature as understood by psychology, sociology, and anthropology? Better because more in keeping with millennia of Catholic tradition? Better because closer to what Holy Mother Church actually recommends? If one is convinced, on solid grounds, that A, B, C is superior to X, Y, Z, and that the very health and fruitfulness of the Church depend on adhering to the former and phasing out the latter, it may even be a sin not to pray and work for the widespread acceptance of the one and the downfall of the other. This is nothing other than a subtle form of the dictatorship of relativism, under which one is never permitted to say A, B, C is better than X, Y, Z, for fear of offending someone by insisting on forgotten truths. Reason’s natural and noble work of discernment and judgment is compromised by politeness masquerading as charity, fideism pretending to be obedience, and laxity dressed up as humility. Lack of due emphasis on externals ends up vitiating the internal powers and resources as well; we lose our common frame of reference and, with it, the most fertile source of our interior growth. To be isolated in this way, to be lulled into thinking ourselves more or less independent of the past and its certainties, is precisely what foments factionalism, as each tribe defines its multifarious allegiances to past, present, and future differently from the way every other tribe would do it. This is the heavy price we pay for sweet autonomy from those dastardly externals. In the traditional Roman Mass, the priest consecrates the wine with this formula: “Hic est enim Calix Sanguinis mei, novi et aeterni Testamenti: Mysterium fidei: qui pro vobis et pro multis effundetur in remissionem peccatorum.” The liturgy is teaching us that the mystery of faith is not properly found in a catechism or voluminous papal documents, in acclamations of the people, or in any social work or political activism, however laudable. The mystery of our faith is found in the heart of the Mass; it is intimately and intrinsically bound up with this precious chalice and its infinitely precious contents. We are thus reminded, again and again, of where our own source and summit must always be, if we are to have the strength to do the Lord’s work. Since it is connatural to man to acquire knowledge through the senses, and since it is most difficult to arise above sensible things, divine providence has appointed sensible things as a reminder to man of things divine, so that thus man’s intention might the more readily be recalled to divine things, not excluding the man whose mind is not equal to the contemplation of divine things in themselves. For this reason sensible sacrifices were instituted; since man offers these to God, not because God needs them, but that man might be reminded that he must refer both himself and all that is his to God as his end, and as the Creator, Governor and Lord of all. Again, sensible things are employed for man’s sanctification, in the form of washings, anointings, food and drink, and the uttering of sensible words, as signifying to man that he receives intelligible gifts from an external source, and from God whose name is expressed by sensible words. Moreover, man performs certain sensible actions, not to arouse God, but to arouse himself to things divine: such as prostrations, genuflections, raising of the voice and singing. Such things are not done as though God needed them, for He knows all things, and His will is unchangeable, and He looks at the affection of the heart, and not the mere movement of the body: but we do them for our own sake, that by them our intention may be fixed on God, and our hearts inflamed. At the same time we thereby confess that God is the author of our soul and body, since we employ both soul and body in the worship we give Him. Ironically, the liturgical reformers in the 1960s and 1970s knew very well that the whole thing was about externals. That is why they moved, as quickly as possible, to change as much as they could do. Change the sign and you change the message. Change the ritual and you change the religion. They knew that the externals were the first and last thing every Christian encounters, prior to learning how to think, prior to formal catechesis, prior to discrimination. Lumen Gentium 11; cf. Sacrosanctum Concilium 10. See my articles "Confusions about Inculturation" and "Is 'Contemporary' Church Music a Good Example of Inculturation?"